Winds sweeping through the Great Plains once robbed the Farm Belt of its future, stripping away overworked topsoil and creating the dreaded Dust Bowl of the 1930s. Today, those winds are bringing new hope to the declining rural communities of the central United States. Nowhere is wind’s promise more palpable than in Cloud County, Kansas, where the soaring turbines of the Meridian Way Wind Farm are boosting incomes and bringing green jobs to a community that has, for decades, watched its children drift away. 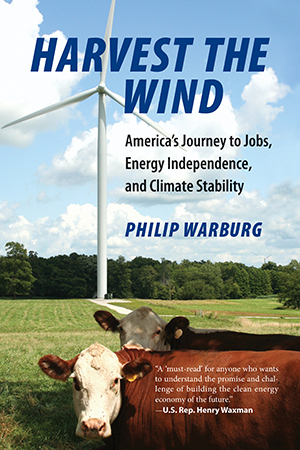 In Harvest the Wind, Philip Warburg brings readers face-to-face with the people behind the green economy-powered resurgence in Cloud County and communities like it across the United States. This corner of Kansas is the first stop on an odyssey that introduces readers to farmers, factory workers, biologists, and high-tech entrepreneurs-all players in a transformative industry that is taking hold across America and around the globe. In this illuminating book, Warburg reveals both the remarkable growth of a breakthrough technology and the formidable challenges it faces. He visits epicenters of anti-wind opposition as well as communities that have embraced wind farms as neighbors. He guides readers through an Iowa turbine assembly plant that is struggling to compete in a global marketplace dominated by European and Chinese manufacturers. And he looks at the thousands of miles that wind-generated power will need to travel to reach American consumers. Harvest the Wind is an earthly antidote to loftier treatises on global warming and green energy. By showing us how practical solutions are being implemented at the local level, Warburg offers an inspirational look at how we can all pursue a saner and more sustainable energy future-while at the same time investing in the nation’s infrastructure and jumpstarting its economy. This book is born of hope and frustration. I was an idealistic teenager when millions of Americans gathered for the first Earth Day in April 1970. At public rallies, on college campuses, and in high schools like mine, people demanded an honest reckoning with how we were destroying our environment. It was a time of tumult, a time of questioning. Then came the Arab oil embargo in 1973, which created panic at the gas pumps and set Washington abuzz with debate about the need to wean America off foreign oil. After college, I joined the energy staff of Senator Charles”Chuck”Percy of Illinois, a former corporate CEO and a Republican who took a pragmatic, bipartisan approach to promoting energy conservation and fossil fuel alternatives. President Jimmy Carter was a willing ally, laying out an energy program aimed at providing 20 percent of America’s energy needs from solar, wind, and other renewable resources by the year 2000. As far-fetched as that goal seemed at the time, Congress got behind a number of measures to support investments in renewable energy projects, including wind farms. My own, as well as the nation’s, hopes for a clean energy future were dashed in 1981, when Ronald Reagan took office and immediately set about dismantling the Carter blueprint. Federal funding for renewable energy was slashed as the new president gave preferential treatment to coal, gas, oil, and nuclear development. Wind energy had begun to take hold in California, but new projects came to a near-halt by the mid-1980s--about the time that Reagan symbolized his disdain for renewable energy by having Carter-era solar panels ripped off the White House roof. The global momentum behind wind power shifted to Europe during the 1990s, with Denmark, Germany, and Spain leading the way. That decade was also a period when climate change moved out of scholarly publications and into the public arena. It was fast becoming clear that curbing our dependence on fossil fuels was an environmental and humanitarian imperative, not just a matter of national security. After working on environmental and human rights issues in the Middle East for many years, I returned to my native New England in 2003 to serve as president of the Conservation Law Foundation, an environmental advocacy group concerned with energy policy and climate change. From that new vantage point, I was struck by how little progress America had made toward Jimmy Carter’s long-forgotten renewable energy target. Wind energy that year accounted for a tenth of a percent of America’s power generation, and solar energy even less. Though George W. Bush had supported wind energy as the governor of his home state of Texas, as president he sent an unambiguous signal to the nation and the world: America was unwilling to lead, or even be part of, a serious global effort to curb greenhouse gas emissions. Stymied by inaction in Washington, my colleagues and I pushed for saner energy policies and practices in New England. While we helped launch the nation’s first multistate effort to curb carbon emissions via a “cap-and-trade” regime called the Regional Greenhouse Gas Initiative, we had a much tougher time moving renewable energy forward on a scale that would make a difference. In advocating for America’s first offshore wind farm, Cape Wind, to be built near the Massachusetts coast, we found ourselves at loggerheads with an extremely well-funded opposition group that was determined to block any encroachment on their backers’ ocean views. What made matters worse, Senator Ted Kennedy--long a champion of renewable energy--had come out against Cape Wind because it was to be sited about five miles from his family’s Hyannis Port vacation compound. If the likes of Senator Kennedy were so unwilling to look beyond their own backyard interests, I wondered how and where America could make wind energy happen. In 2009, I set out to explore this question. My journey began on the Kansas prairie, in half-forgotten Cloud County, where old-timers have long watched their children and grandchildren leave family farms and ranches in search of more lucrative and perhaps less arduous work elsewhere. A large commercial wind farm went into operation there in December 2008, its giant turbines generating enough electricity for 55,000 Kansas and Missouri households. To understand what wind power has brought to this struggling corner of rural America, I spent time getting to know the landowners who have rented out sections of their fields and pastures, the educators who have reshaped the local community college as a training center for wind energy technicians, and the developers who worked with community partners to move the Meridian Way Wind Farm from concept to completion. I also traveled to Rust Belt towns of the Midwest, where I learned about the thousands of new jobs that the wind industry has created for young and old alike, in retooled factories that once made car parts, printing presses, and construction cranes. And at wind farm sites across the heartland, truckers and construction crews expressed their excitement at being part of an emerging industry with a promising future, and newly trained technicians described the rigors of working atop 300-foot towers in hundred-degree heat and subzero cold. Wind is not just a new presence on the American working landscape. It is also an expanding force in the global marketplace. To gain a better grasp of wind’s broader market dynamics, I traveled to Denmark, which is proud to be producing one fifth of its power from wind. This small Scandinavian nation is also home to the world’s top-ranked turbine supplier, Vestas Wind Systems, which made the machines that now spin out Cloud County’s wind power. My next stop was China, vast and ambitious, outstripping all other nations in its wind energy use. Not surprisingly, the Asian giant is also emerging as a major rival to Europe and the United States in its wind energy manufacturing. Today, America gets about 3 percent of its electricity from wind-- hardly enough to get excited about. Yet, in raw terms, our wind energy resource--like our solar potential--vastly outstrips our current and future power needs. The U.S. Department of Energy conservatively predicts that, by 2030, wind energy could provide 20 percent of America’s electricity. Other experts see wind generating more than half our nation’s electricity by mid-century, so long as we invest in new transmission lines that will open up some of the remote areas where our wind resources are greatest, and so long as we develop a “smart grid” that can match the variable flow of wind-generated power to consumers’ needs. Like any other energy technology, wind power has its downsides. Birds and bats may be killed by turbines, and the habitats of closely watched species like the sage grouse, the prairie chicken, and the Indiana bat may be at risk in some areas. Wind farms also can pose problems for people living nearby. Some object to the visual presence of towering turbines; others complain about the noise. At places as far-flung as Vermont’s Taconic Mountains and the Flint Hills of Kansas, the tensions surrounding wind energy have caused bitter and lasting divisions among neighbors and former friends. Wind power’s future success depends on our addressing these issues responsibly. As I made my way across vast stretches of a country that I previously only knew through books and the media, I often thought of the advice that Franklin D. Roosevelt gave to a headstrong Wall Street banker who had just resigned from his Brain Trust, disillusioned with the New Deal’s spending and monetary policies. “Please get yourself an obviously secondhand Ford car,” the president counseled. “[P]ut on your oldest clothes and start west for the Pacific Coast, undertaking beforehand not to speak on the entire trip with any banker or business executive (except gas station owners), and to put up at no hotel where you have to pay more than $1.50 a night.”1 The banker--my father--apparently felt no need to follow FDR’s advice. I think he missed out on a lot. Although the motels where I stayed charged considerably more than $1.50 a night, the cross section of Americans whom I met-- farmers, ranchers, factory workers, shop owners, truckers, crane operators, and more--deepened my appreciation and respect for the people who inhabit so much of this land. I also came to understand much more fully the ways that America’s push toward renewable energy has changed people’s lives for the better. Tens of thousands of Americans have found new jobs in the factory and field. Thousands of others have seen their flagging farm incomes boosted by generous, multi-year lease payments from wind developers. Yet these people see more in our nation’s wind energy investment than a pay stub or a rent check. The devastating consequences of climate change may still seem remote, but the people involved in our wind energy sector are fiercely proud of their role in advancing the nation’s quest for energy independence. Too many of their family members, friends, and neighbors have been sent overseas to fight wars that they see, at least in part, as a struggle for control over waning energy resources. Too many loved ones have come back from those wars defeated in spirit, physically maimed, or in body bags. Too much taxpayer money has been spent fighting distant wars with no clear purpose--funds that would have been far better spent creating jobs and new industries here at home. Investing in wind energy will not bring an end to Middle East strife, but it can begin to wean our nation off the fossil and nuclear fuels that we have come to associate far too closely with American prosperity. Now is the time to reshape our energy economy. With wind, we can tap an inexhaustible domestic energy resource while showing that America finally is willing to join--and even lead--the battle for climate stability.""